The Calvino Prize is an annual fiction competition sponsored by the Creative Writing Program in the English Department of the University of Louisville. They will be awarded to outstanding pieces of fiction in the fabulist experimentalist style of Italo Calvino. Please note that these prizes are meant to encourage experimental writing, in the mode of Calvino, and are not meant to encourage merely imitative work. The first place entry will be published in Miracle Monocle journal at the University of Louisville. Further, the winner will be invited to read the winning entry, all expenses paid (within the continental US), at the Louisville Conference on Literature and Culture Since 1900 held at the University of Louisville every February. The 10 finalists will be posted on the website. This year's Final Judge, Kelly Link, has selected a winner and runner up for the 2018 competition. Each year the judging process gets more and more difficult, and, once again, the prize attracted attention from hundreds of writers from around the world. Please keep an eye out for next year's Calvino Prize, which will open for submissions on July 1, 2019 via the Submittable platform. Amy Parker is a fiction writer with an MFA from the Iowa Writers’ Workshop. 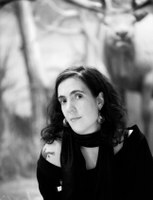 Her first book, a collection of linked short stories (Beasts and Children, Houghton Mifflin Harcourt, 2016) was described by Kirkus Reviews as “riveting” and by Booklist as “An electrifying, daring, and magical debut collection.” Her work has appeared in Narrative, Five Chapters, At Length, Los Angeles Review Print Quarterly, and elsewhere. She is the recipient of a James Michener Fellowship in fiction and a Meta-Rosenberg fellowship in fiction, as well as grants from the Ucross Foundation, the Clarion Foundation, the Marble House Foundation, and the Sustainable Arts Foundation/Vermont Studio Center. She is a lecturer at the University of Iowa’s Center for Writing, and she lives in Iowa City. Jake Buckholz, “Selections from the Whole Vile Lot"
Dan Tremaglio, “A Presentation of the Top-five Biggest Objects in the Universe on the Eve of the Kronia"